With ‘The Rise of Sneaker Culture’ the Brooklyn Museum is presenting a global and entire show on the sneaker phenomenon. Worn everyday, throughout the world and for decades, sneakers have acquired a status going beyond utility. They are not only made to run or walk comfortably, but convey social and cultural conventions transgressing the simple use of a shoe. More than 150 different pairs are on view in order to present the emergence, evolution and symbolism of the sneakers. Nowadays seen as an urban icon, they made their first step as a sport shoe. It was in the 1980s when youth cultures of New York neighborhoods adopted the sports shoe and turned it into a fashion piece. Their heroes such as basketballers have been the main source of inspiration. The kids wanted to show their affiliation to the players while maybe hoping to become as powerful and successful as the sportsmen. The transition from sports to fashion show is not least ascribable to hip hop group Run-D.M.C. 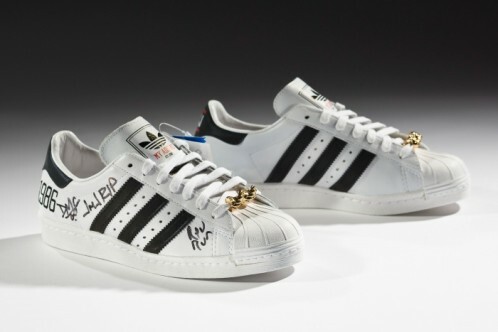 who released a “My Adidas” – a song devoted to a pair of Adidas shoes – in 1986. It was an international success. Teenagers all over the world wanted to wear a pair of Adidas shoes. Still today, the success of the sneaker is manifested by crossover collaborations. 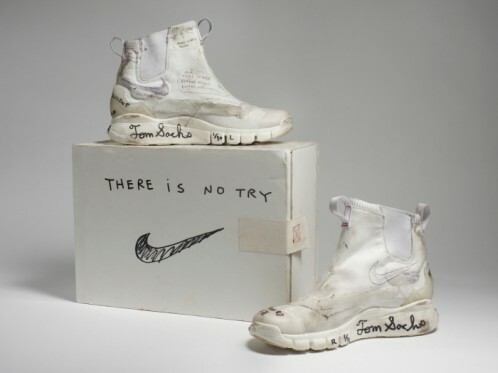 Artist Tom Sachs, for example, turned a pair of Nike shoes into a piece of art. Photo, film footage, design drawings, are exploring the social history and marketing campaigns of a trend that can reach obsession for some of its admirers and wearers. ‘The Rise of Sneaker Culture’ value the spread of a very unique shoe and its tremendous evolution over the past two centuries. Adidas x Run–DMC. 25th Anniversary Superstar, 2011. Courtesy of Run–DMC, collection of Erik Blam. Nike x Tom Sachs. NikeCraft Lunar Underboot Aeroply Experimentation Research Boot Prototype, 2008–12. Collection of the artist.